Surf contest is incredibly popular in Australia and it can seem like everyone is an expert, but in fact even the pros had to start somewhere. Here are some things to consider if you want to take up surfing. As a beginner you may want to start with some of the easier surf beaches. Setting out for the first time on Bell’s Beach, home of the annual Rip Curl Pro Surf competition, might not be the best move. Whichever part of Australia you are in, doing some research to find out your nearest gentle surf beach is a good idea. Some examples are: Bondi Beach in Sydney, Seven Mile Beach near Byron Bay, NSW, Noosa’s Main Beach in Queensland, Back Beach near Lancelin in WA or Cape Bridgewater on The Great Ocean Road. You may be lucky enough to have friends who are not only fantastic surfers, but also great teachers and have the time, will and patience to devote to your new pursuit. Failing that, taking a class at a surf school might be your best option. At a surf school, they will brief you on the surf and safety rules and take you through your paces from paddling to catching waves and standing. Some claim they’ll have you up on a board, surfing by the end of lesson one! They will also give you the opportunity to try different conditions and hone your skills as you go. Classes can last from a couple of hours to longer, often in small groups of around 6 people or you can choose to have a private lesson. Normally you would sign up for a number of lessons to get to the point where you are confident enough to enjoy surfing with your friends. The pricing generally varies depending on the time of year, with the more expensive high season being from December through to March. 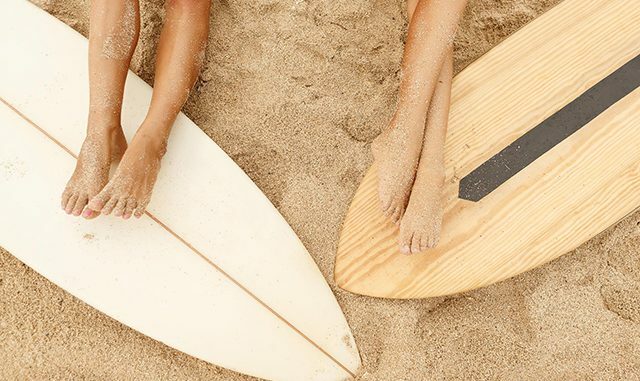 If you choose to learn from a surf school, they will normally provide all the equipment you need, a surfboard, a wetsuit and even sun block on occasion, as well as making sure you know what you need to in order to keep safe on the surf. Safety is an important consideration, so if you’re heading out with friends for the first time, make sure you understand the rules of that beach, what and where to avoid and what to do if you get into trouble. Surfing is an exhilarating and fun sport which can be also be safe with a certain amount of respect for the ocean and your own capabilities.